"Great article! I am always looking for better, more efficient ways to pack ... read full review"
Packing the cooler safely for an afternoon picnic or a weekend getaway will help to protect your family from food borne illnesses. A properly packed cooler will keep your food below 40º F. Coolers with a temperature of 40º F or higher rapidly grow bacteria. Wash your hands. When packing and handling food, clean hands will help prevent cross contamination of bacteria from uncooked to cooked foods. Although hot soapy water is best, there are many hand sanitizing products (liquids/wipes) available when clean, hot water is not available. Pack two coolers. It is best to bring a cooler for beverages and a separate cooler for perishable food. The beverage cooler is opened frequently, allowing cold air to escape. The food cooler will stay colder longer because it will be opened less frequently. Depending on the length of your outing, a separate cooler with extra ice will help you to replenish ice in food and beverage coolers. Plastic water containers that have been frozen serve two purposes. They keep food/beverages cold and, as they melt, provide fresh water for consumption. Fill empty plastic containers with water from home. Fill approximately 1 to 2 inches from the top, to allow for expansion when water freezes. Clean plastic milk containers work well for this purpose. Ice packs are available in many different sizes and styles. To make your own, simply fill a large, air tight, waterproof plastic bag with clean water and freeze. Pack water from home for drinking and washing. This will ensure that the water you are drinking and using for cleaning is safe. 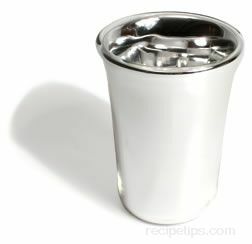 An air tight bag filled with ice cubes from home will come in handy when serving beverages in glasses. Wash all perishable foods, such as fruits & vegetables, before leaving home. Pack all foods in air tight bags or sealed plastic containers to prevent cross contamination. Store utensils separately from food to avoid cross contamination. 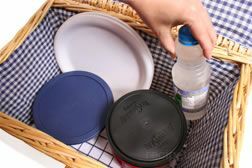 Because it is difficult to sanitize utensils on a picnic, bring two of every utensil to avoid cross contamination. Pack non-perishable foods separate from perishable foods. A laundry basket or large cardboard box eliminates the need to dig through grocery bags. Condiments can be placed in large air tight bags or sealed plastic storage containers. Beverage cooler: Pre-chill beverages before placing them in the cooler. 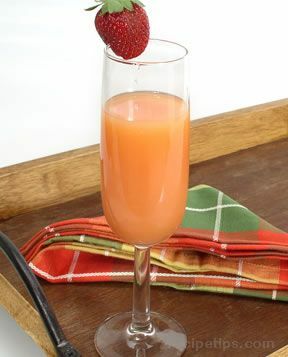 Pre-cooling preserves ice, so you will need less ice to cool drinks down. Since cold air travels down, place beverages in the cooler first and ice last. To quickly chill beverages, use crushed ice. Do not drain the cold water left by melting ice. The cold water preserves the remaining ice and keeps beverages cold. Keep cooler out of the sun and out of a hot car, finding a safe spot in a shaded area. Keep cooler closed as much as possible to prevent cold air from escaping. Food cooler: To keep food cold for weekend getaways, a block of ice is best. Block ice keeps food cold for longer periods of time when compared to crushed or cubed ice. A mixture of block and cubed ice is recommended. Place block ice at the bottom of the cooler. Place perishable foods directly on block ice. Cover perishable foods with cubed ice. Pack perishable foods directly from the refrigerator into the cooler. Keep foods dry and safe from cross contamination by placing in air tight bags or sealed plastic containers. If you prefer that your food stays frozen, place dry ice directly on top of the food. Do not allow the dry ice to come in contact with your hands, food, or liner of your cooler. Be sure to wrap dry ice in several layers of newspaper or ask your dry ice distributor to provide a safe alternative. Keep cooler out of the sun and out of a hot car, finding a safe spot in a shaded area. Keep cooler closed as much as possible to prevent cold air from escaping. Keep hot foods hot. Line your cooler with towels. Wrap hot casserole bowls containing hot foods with more towels and place in cooler. Not allowing for empty space will help keep foods hot. A cooler is not meant to re-chill food that has remained at a temperature of 40°F or above for one hour or more. Only food that has remained at safe temperatures should be placed back into the cooler. To be safe, throw out any food you are unsure of. Coolers with a temperature of 40º F or higher rapidly grow bacteria. Thaw items in the refrigerator or cooler, do not thaw meat at room temperature or in the sun. Bring more than one cutting board and do not prepare more than one type of meat on one cutting board. Do not place cooked meats on cutting board used for preparing raw meats. The same is true for any other utensils that have been in contact with raw meat. Convenient one use cutting sheets are now available to help you protect your family from food borne illnesses. A spray bottle with a mixture of 1 teaspoon of bleach and 1 quart of water is a safe sanitizer for such things as picnic tables and cutting boards after use. Allow the areas cleaned to air dry or dry with a clean paper towel rather than a cloth towel. 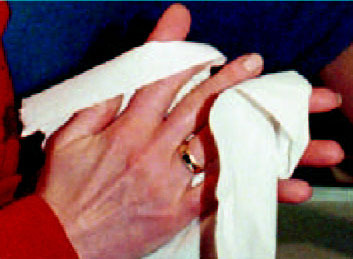 Drying with a dirty cloth will re-contaminate the surface. Whenever possible, wash contaminated surfaces with hot soapy water, sanitize with bleach mixture, and rinse with clean water. If unsure of the cleanliness of the grill you will be using, cover with tinfoil and cut slits to allow heat to penetrate. A non-stick spray applied to the tinfoil before heating will help prevent foods from sticking. It's always wise to bring your meat thermometer if you plan to grill out. If juices of the meat do not run clear and show signs of blood, keep cooking. Do not pre-cook meat and plan to finish the cooking at the picnic. Meat should be kept cold and cooked at the site to prevent bacteria. After you have returned home, throw any leftovers that have become wet. Leftovers that have been left out for 1 hour on hot days should be thrown. When in doubt, throw it out. Wash cooler with hot soapy water. Use kitchen ingredients, such as baking soda, to remove stains. To sanitize cooler, spray the inside with a mixture of 1 teaspoon. of liquid bleach to 1 quart of water. Let mixture sit for 10 minutes and wash again with clean water. Leave lid open for cooler to air dry before storing. "Great article! I am always looking for better, more efficient ways to pack things. I saw on www.smoothmovesupplies.com some helpful tools for the packing process for moving houses. My family is moving soon, so I am trying to be educated on how to be a good packer!"